All my life I have been a very athletic person. I played basketball and golf all throughout high school and wanted to play a little in college as well. It was not until college that I started having problems on my right knee, so I am glad that I had 19 great years without a significant injury like an ACL tear. It started the summer of 2004, I was going into my junior year of college at the Univ. of Arizona and one weekend, I was playing in a charity summer tournament and in the semifinal game, I drove to the hoop, jump stopped, and tried to pump fake and go up when my right knee buckled on me and I heard a huge "pop." It was excruciating and it didn't settle in on me until the next day I might have just torn my ACL. My fears were confirmed a week later when my doctor got my MRI results. 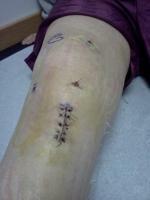 I had surgery in September of '04 and wen through rehab throughout my first semester junior year. I thought it went wonderful and I was back playing by Christmas break! It's not until now I realized I might have tried to get back too early. When I was playing over Christmas, my knee gave out on me, but didn't pop like it did the first time, so I thought I was OK, just kinda got me scared. I took it easy until I played intramural ball spring of junior year and I played horribly the whole time. I was too afraid to do anything, jump, drive, etc. My senior year I started playing a little more and started gaining more confidence again in my knee. There were a few times though, my knee would give out on me when I pivoted quickly or landed on it after a lay up or something. Still though, no "pop" just pain and some swelling for a couple days. I confronted my surgeon about it, but he assured me that if I re-tore my graft, I would certainly know it. This went on until I graduated and I got my first job in Phoenix. the community in which I lived in and on the most part, I played fairly well. One day though, in the spring time, I went up for a lay up and got knocked down by a defender and landed on my right knee where it gave out on me again and it hurt pretty badly. I didn't think much of it again, just iced it and rehabbed it for a week or so. The next week though, I was out of town for business and my knee felt funny. It would lock up on me and hurt a little more. I moved to Chicago with my job that summer and after a few months of running on the treadmill and my knee hurting badly and locking and popping on me, I saw an orthopedic surgeon. He examined me and told me that my symptoms sound like I tore my lateral meniscus. I got an MRI in September of this year and it confirmed that not only did I have a torn meniscus, I did in fact, re tear my ACL and had some signs that made him want to consider microfracture surgery. . I decided that I wanted to wait on getting my ACL reconstructed because I don't play basketball a whole lot anymore, mostly because of my knee, but also I was at the point in my life where I didn't think I would have it in me to go through so much rehab again. I just had my surgery last week (October 9, 2008) to remove my meniscus tear and some loose "debris" floating around and am thinking about when I might want to go through the heavy duty stuff. I know at some point I will, maybe next year, maybe two. I just know that after reading so many stories, that I am not the only one to go through multiple surgeries so I shouldn't be feeling sorry for myself. ACL tears are no fun and I know that going through another reconstruction (plus microfracture)does not guarantee that I will be able to put all this behind me. I just have to pray that when I do go through it, I have the dedication and determination to try.